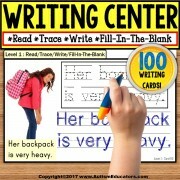 This set is aligned with State Common Core Writing Standards. JUST PRINT AND PLACE IN A 1 ½” BINDER AND YOU’RE READY FOR A SUCCESSFUL WRITING YEAR! PLEASE NOTE: Most states have adopted Common Core State Standards. Do NOT purchase if the state you teach in has not adopted these standards. Thank you! 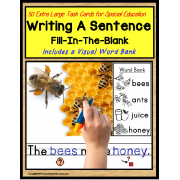 • Writing templates contain lines and visuals suited for students with special learning needs and fine motor challenges. Pages may contain visually guided lines, pictures, colors, or statements that help students with the writing process. WHAT GRADES OR AGES ARE INCLUDED? First Grade, Second Grade, and Third Grade. Each writing template is aligned to a grade level standard, which is shown on the top of each template page. 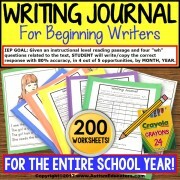 This writing activity is geared for students accessing STATE WRITING STANDARDS. 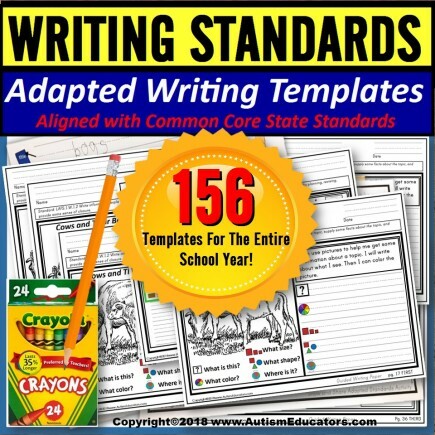 You are welcome to stretch your students writing abilities by using templates from varying grade levels (either up or down). Either way, you’ll be providing an incredible writing opportunity! HOW CAN I USE THE IEP GOALS THAT ARE PROVIDED? writing templates. ALL of the suggested IEP Goals are aligned to Common Core Writing Standards. You may read through the goals and decide that you have found a very appropriate goal for an upcoming IEP, or have discovered that your student has mastered that goal. Please feel welcome to use any of these IEP Goals for your students. 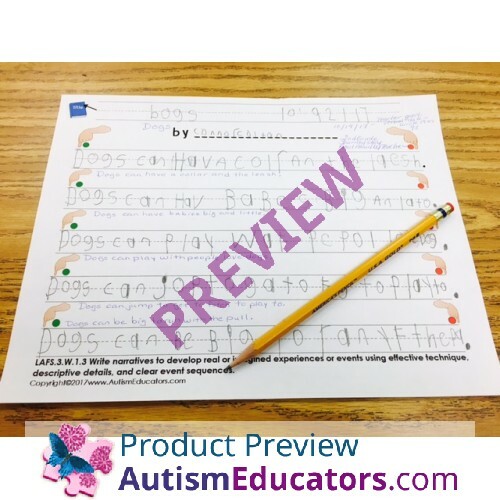 Depending on your school district and their IEP writing requirements, you may have to reword a beginning phrase or time measurement, but the “meat and potatoes” of the goal is already waiting for you! HOW CAN I ADAPT THE TEMPLATE IF MY STUDENT NEEDS PROMPTS OR EXTRA HELP DURING WRITING? • Then, by all means, GIVE THE CHILD THE HELP HE OR SHE REQUIRES. That’s what “adapted” means for our kids. Let’s give them the help they need to be successful writers! If the student is followingSTATE STANDARDS, then this will be solid documentation of their skill level. As I have said, PLEASE provide them with the support he or she needs. 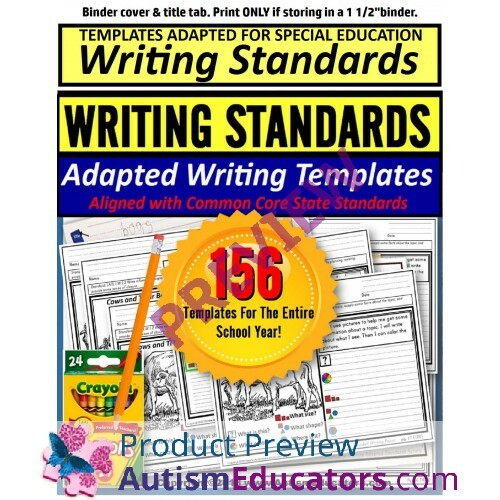 The writing template will show parents, administrators, and therapists, the adaptations that were made to help the child. SO, CAN YOU TELL ME EVERYTHING THAT’S INCLUDED IN THIS ADAPTED WRITING TEMPLATE SET? I sure can…and here you go! • Suggestions on how to implement in a multi-grade level, self-contained, or inclusion classroom during whole group, small group, or one-on-one. (3.) Page K25 can be edited for unlimited use. The teacher can type in OPINION QUESTIONS. (3.) Page 31 and 38 can be edited for unlimited use. The teacher can type in PASSAGES. • MY STATE DOESN’T FOLLOW COMMON CORE. WHEN WILL MY STATE’S STANDARDS BE AVAILABLE? Please feel welcome to email me at DSinger@AutismEducators.com with your state. You may also leave me a message on my Facebook page with the info and I’ll respond quickly!